With 25-year power performance guarantees on most systems – plus State and Federal incentives that offer significant financial savings $$$ -- there’s never been a better time to Go Solar and Zero out your electric bill! Sunlight strikes the Panels of your Solar system and a flow of (DC) direct current electricity is produced by the Solar cells. 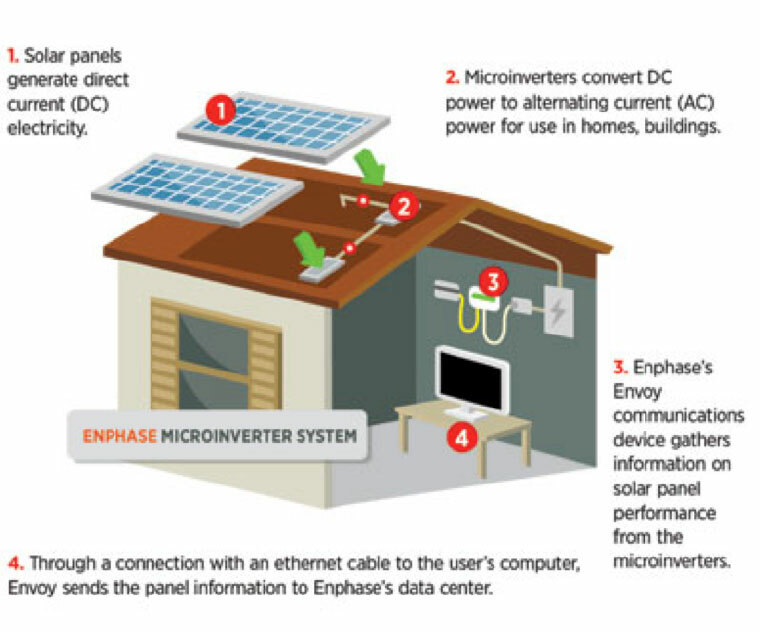 The Solar generated (DC) electricity is fed into a central inverter (Illustration A) --OR individual microinverters for each Solar Panel (Illustration B)-- that converts the DC power into household grade (AC) electricity. The (AC) electricity feeds into your main electrical circuit breaker Panel that supplies power to your house. Your main electric Panel is also connected to a specially installed bi-directional meter. 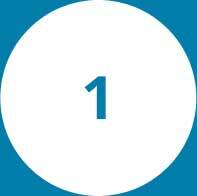 This meter is connected to your electrical grid, which is the utility's means of delivering electricity. This allows household grade electricity to flow into your home or business from the power company. On days when your Solar electric system generates more power than you use, your utility meter will actually spin backwards. You then receive credit from your utility company for the electricity you produce at the same kilowatt hour rate they charge you; this is referred to as "net metering." It's that easy! 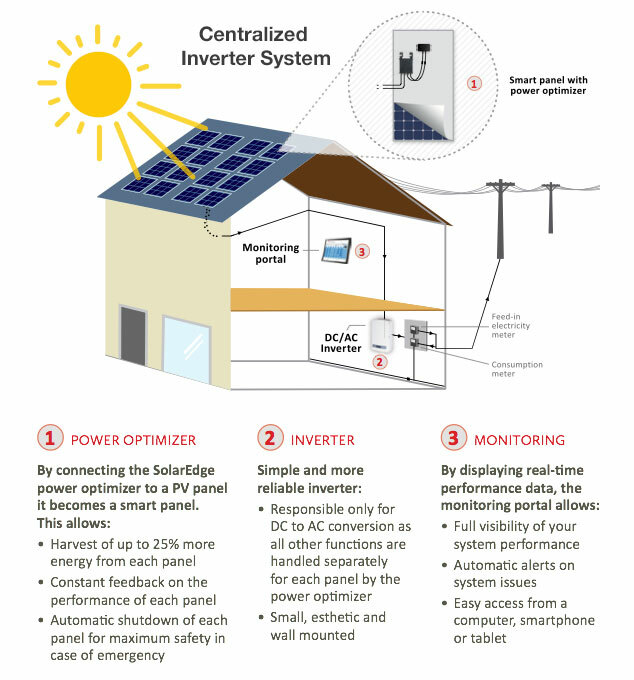 Your Solar electric/photovoltaic grid-tied system operates automatically and quietly, producing your own clean, free electricity for years and years to come! Can I zero out my electric bill? Yes you can zero out your utility bill, however you will still receive a small customer/service charge from your utility company each month. At the end of 12 months your utility bill will be trued up (reconciled). Your utility company evaluates the amount of power that you produced versus the amount of power that you used and you will make a payment if your solar system produced less power than you used or you receive a refund if your solar system produced more power than you used. This is all part of a Net Metering Agreement (NEM) with the utility company. 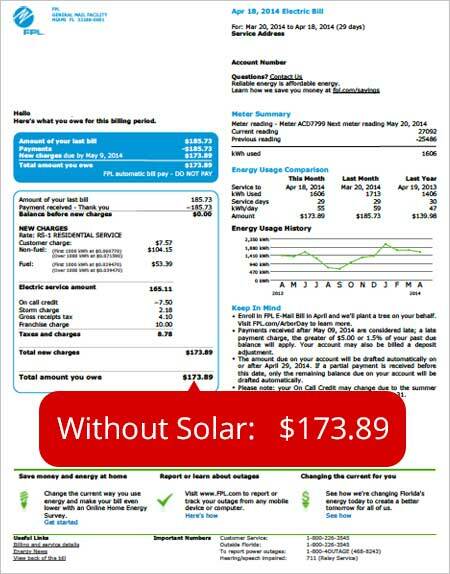 This agreement is executed between you and your utility company prior to activation of your new PV solar power system. What incentives are available for Solar? A 30% Federal Tax Credit is available for the purchase of a new PV Solar power system. You must pay taxes to take advantage of a federal tax credit. PACE is an innovative way to finance solar electric systems in which your monthly payment is condensed into one yearly payment and is added in with your property tax yearly bill. To qualify you have to have equity in your home. It doesn't take into account your credit rating so people who have bad credit can still qualify as long as they have enough equity built up in the house. What is the Solar Equipment Warranty? Warranties vary depending upon which type of solar system you invest in and the way you choose to go Solar. If you purchase your new PV Solar system, most systems come with a 25-year power production guarantee on the panels and anywhere from a 10- to 25-year guarantee on the inverters. Am I tied to the grid? In most cases, the answer is yes. Your new solar panels will produce power during the day but not at night so you will still be dependent upon your local utility to provide power during those times when your solar system is not producing enough power to offset your usage. Learn more about how battery storage can effect your options for being tied to the grid or off grid. Due to safety regulations, the inverter(s) shut down automatically during a blackout. When power is restored to the grid, your system automatically resumes operation. Although, some systems can be equipped with a battery backup system which can power your home in the event of a power outage. Your solar system is working very hard during daylight to produce electricity. When your system is not generating energy, the excess of power that was created during the day offsets the electricity used at night. The result is a lower electricity bill and a happier you. How do I monitor how much electricity my Solar Electric system is producing? "I am very happy with both the solar hot water and solar electric systems. Very good investment as I am saving in the vicinity of $200/month on the electric bill. The first 2 electric bills after the system was installed were for $8.25 each month. I would recommend it to anyone!" 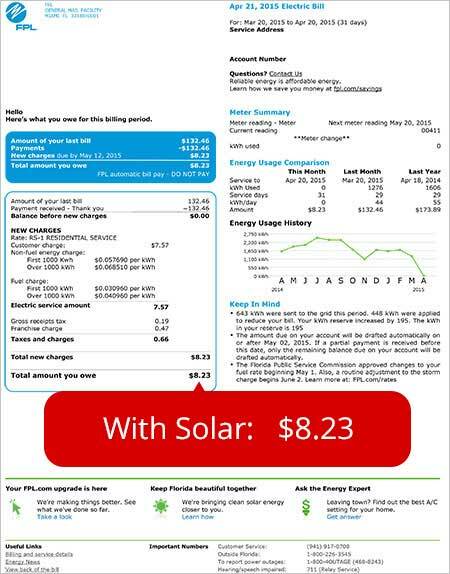 "Our electric bill is now $8 – it used to be $200! Everything is great!" "Harrimans installed a full array of solar products; 37 PV panels, Solar hot water system, Solar pool heating system, Saltwater pool system. Their employees, from the salesman Robert, to the folks who installed the equipment, and the office staff, were wonderful and efficient. Highly recommend the company!"